Southern house on this awesome photo site. Here's the thing: I was born and raised here in Southern California. I've never lived anywhere else, except for about a year up in Bakersfield when I was 9 (and Bakersfield is just barely north enough of L.A. county to not quite qualify for SoCal status itself). Oh, and then those 2 semesters, spent down in the Old South at Ole Miss, when I was 25. Thinking about this post, it's clear that my time in Oxford really deserves its own separate post, since that was a very sensory and emotional nine months of my life. A time when everything changed. It's such a subtle, hard-to-pin-down feeling. It's all sensory, and it's based on something in the breeze, some feel in the air. 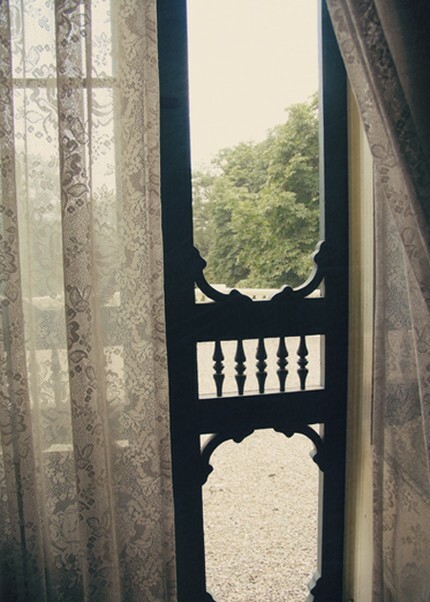 Once, long ago, I had a dream that I was sitting on the front porch of an old house. It was in the South. There were bees droning in the bushes near the steps. 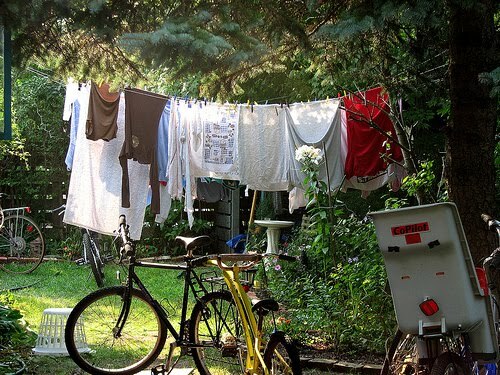 There was laundry on the line, and a sound of a train in the distance. It was incredibly vivid, and I carry that memory of it always, always with the faint tug that somehow, that is where I belong. It has something to do with blue, blue skies that are seared with bright sunshine and white puffy clouds. Perhaps it's based on my childhood visual memories of lying on the bench backseat of our Ford LTD (back when kids could actually LIE DOWN in the back of cars), and watching the passing sky and telephone poles during our frequent weekend trips of backroads and byways. Hearing Arlo Guthrie's "City of New Orleans" brings it on. So does much of the Allman Brothers, especially "Ramblin' Man" and "Blue Sky." Speaking of ramblin', I feel that's what I'm pretty much doing here, trying to describe something is less wanderlust (which I also know well), but culturelust. Is there such a thing? Yes. At least in my head. I am well-versed in the best of Southern lit: Ms. Flannery O'Connor, Ms. Carson McCullers, Mr. Peter Taylor, a great short story writer. Early Mr. Capote. And don't even get me started on Mr. Tennesee Williams. 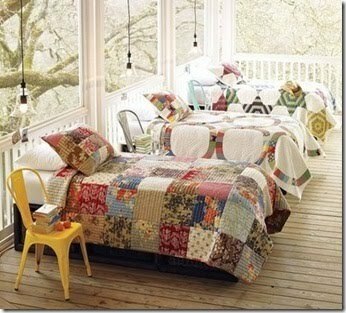 A sunporch with wooden floors, patchwork quilts, painted metal chairs and a stack of books to read. From a Pottery Barn catalog last year. 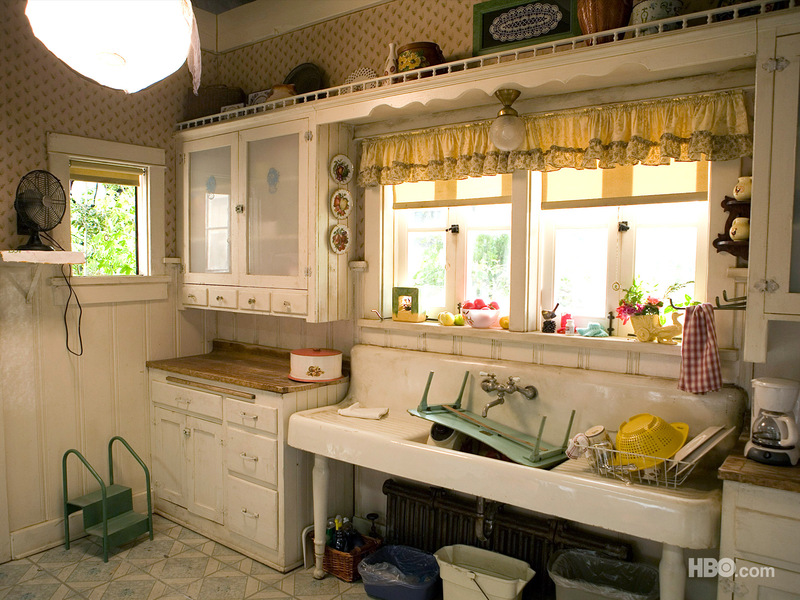 The kitchen belonging to Suzie Stackhouse's Gran on True Blood. Oh my gosh I love this picture. I see myself in here, dripping sweat on a hot and humid day, canning peaches. I've never canned anything in my life and would probably hate the mess and fuss. No matter. The set design pics such as this, and a link to the killer-awesome Southern Gothic show trailer is what convinced me I had to give True Blood a try. 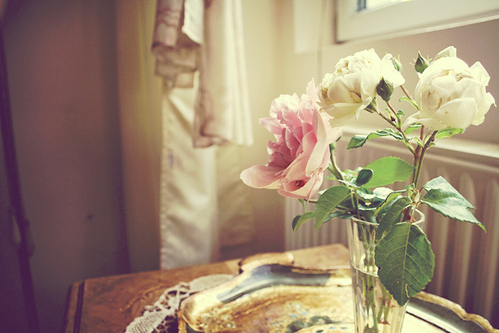 Blowsy roses on a silver tray. Something about this photo gives me the itch to go read some Faulkner. "Caddie -- she smelled like leaves..."
Summer Breeze. Found here. I really disliked the movie Away We Go. Smug and pretentious and cutesy-smart. But that house they got to move into at the end? TO DIE. What was all the hemming & hawing and cross-country searching about? This picture kinda reminds me of that house; it feels like there's a river very close by. All right. So this is just the tip of a really, really big iceberg for me. I could go on and on, showing you pictures, linking to music. I guess I'm just living in my own private Georgia. Mississippi. Whatever. Were any of the above photos pictures even taken in the South? Does it matter? Most days, I am drawn to contemporary, clean and colorful lines. Modern homes with lots of windows get me drooling. But some days, I think of my farmhouse dream, of a slowly twirling ceiling fan, and sweating glasses of sweet ice tea. It's my second home, an escape from the everyday. And it's all up here, right in my little noggin. Do you have your own private landscape? Have you ever been there, or is just a whisper of passing dappled sunlight, a memory of an old dream? I've got to think about my own personal landscape, but holy crap, I love how you wrote this post. Well, gosh, thank you! Very nice of you to say.